If you want to learn more or opt out of all or some cookies, please see the privacy. Cetara is a small village on the Amalfi Coast, 5Km far from Salerno and 15Km far from Amalfi. Due to its closeness to Capo d’Orso, it is windy in spring and summer time: in the hottest hours of the day, a thermal wind shows up, and it is possible to sail “starboard tack”. It presents good conditions for freeride, freestyle and slalom specialities. When the thermal wind is strenghtened by the mistral, the waves can overcome one meter. The North Wind gets in quite well and it is possible to sail port tack, even if it does not reach the coast. South winds do not get in and are often an obstacle to the thermal wind. From the sea it is a pleasure to appreciate the suggestive landscape of the village, the dome of the cathedral, and the ancient viceregal tower on a square base. 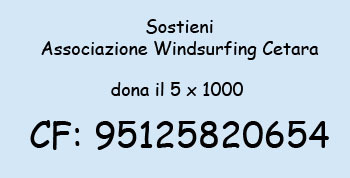 To enjoy all windy days, the “Windusurfing Cetara” association and the “Amici di Guido” association, in cooperation with the municipality of the village, have installed a wind detector. Click here to check the actual values of the wind in Cetara.